Why is it that, time and again, intelligent, educated people end up falling for ideas that turn out on closer examination to be nonsense? We live in a supposedly rational age, yet crazy notions seem increasingly mainstream. New Age peddlers claim to cure Aids with vitamin tablets. Media gatekeepers stoke panic and regurgitate corporate press releases in the name of 'balance'. Wild-eyed men in sandwich boards blame it all on the CIA.Even the word 'sceptic' has been appropriated by cranks and conspiracy theorists bent on rewriting history and debunking sound science. But while it may be easier than ever for nonsense to spread, it's never been simpler to fight back. 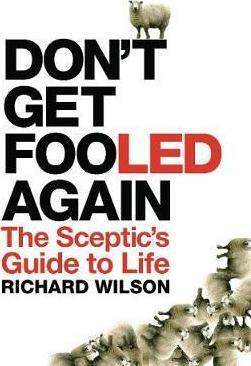 "Don't Get Fooled Again" offers practical tools for cutting through the claptrap and unravelling the spin - tackling propaganda, the psychology of deception, pseudo-news, bogus science, the weird cult of 'Aids reappraisal', numerous conspiracy theories (including the one about weapons of mass destruction in Iraq), and much more. Richard Wilson's book is user-friendly, enjoyable, shot through with polemic - and argues forcefully for a positive solution. Richard Wilson read Philosophy at University College London. His first book, Titanic Express, recounts his search for the truth about the death of his sister Charlotte, who was killed in Burundi in 2000. He now works for a human rights organisation and lives in London with his wife, Heleen.